Many of the world’s best 1500m runners descended upon Monaco on Friday and nearly all of them brought their “A” game with 10 of the top 12 setting lifetime bests. However, one man was head and shoulders above everyone else. Kenya’s Asbel Kiprop put on a running exhibition of sublime beauty as he absolutely crushed the field, winning by over two seconds in 3:26.69, to become the third-fastest human being ever at 1500. 2012 Olympic champion Taoufik Makhloufi joined the sub-3:30 club in second in 3:28.75, Morocco’s Abdelaati Iguider become one of the top 10 fastest of all time in 3rd in 3:28.79, Mo Farah ran 3:28 (3:28.93) for the second time in Monaco in 4th, Nick Willis lowered his Kiwi record to 3:29.66, and Kenyan newcomerElijah Manangoi chopped 5 seconds off his personal best to join the sub-3:30 club in his first Diamond League race. American Matt Centrowitz was well beaten in 10th, but left with a 3:30.40 pr, a time that makes him the fastest American-born runner in history (and #3 American overall). This race was all Kiprop. The last two years in Monaco he showed himself to be the only runner in the field to not be afraid to go with the rabbits and it was no different this year. The two rabbits, Andrew Rotich and Jackson Kivuva, took out the opening 400m in 53.72 and Kiprop was with them with a gap back to Mo Farah. The same five-meter gap was there at 800 as Kivuva hit 800 in 1:50.37. 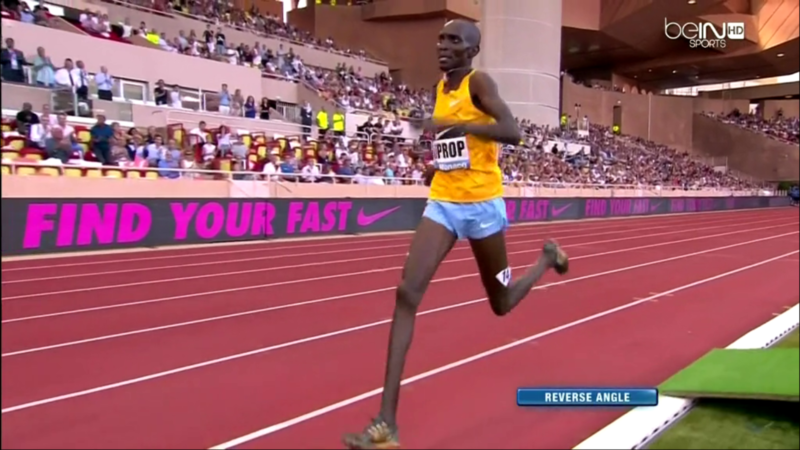 Kiprop then began to take over. He followed Kivuva onto the homestretch and then Kivuva drifted wide letting Kiprop know he was all alone. Kiprop hit 1100 in just under 2:32 and the closest challenger was Farah in about 2:33.5 as 10 guys came through under 2:45. 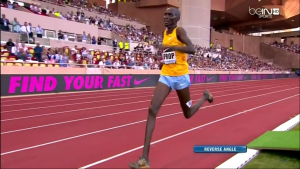 Kiprop did not come back to the field like he did last year in Monaco. He ran away from them on the final lap. It was him versus the clock and he stopped it at 3:26.69. There was a three-way battle for second and Makhloufi finished just ahead of Iguider and Farah. Nick Willis just edged Manangoi for a top-5 spot. The top 10 were well clear of the rest of the field. Matt Centrowitz was last in the group and he still left with a .69 of a second pr.